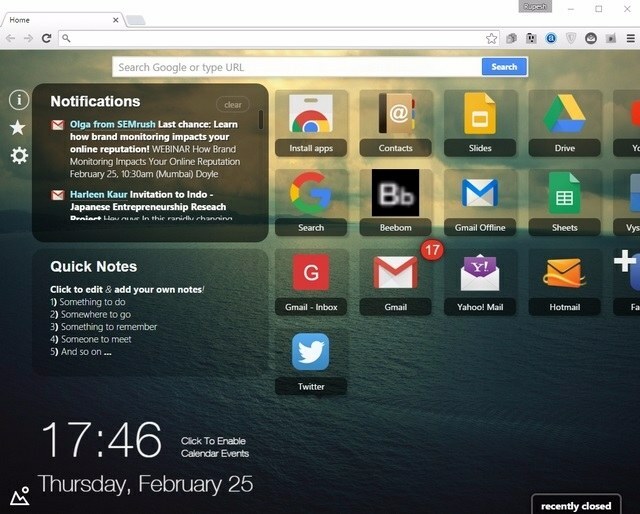 We are all familiar with Google Chrome’s New Tab page but not all of us have a liking to it. The new tab page on Chrome is pretty bland with commonly visited websites, bookmarks, shortcuts to apps, mail and search. The problem lies in the fact that there are very few to no customization options available. 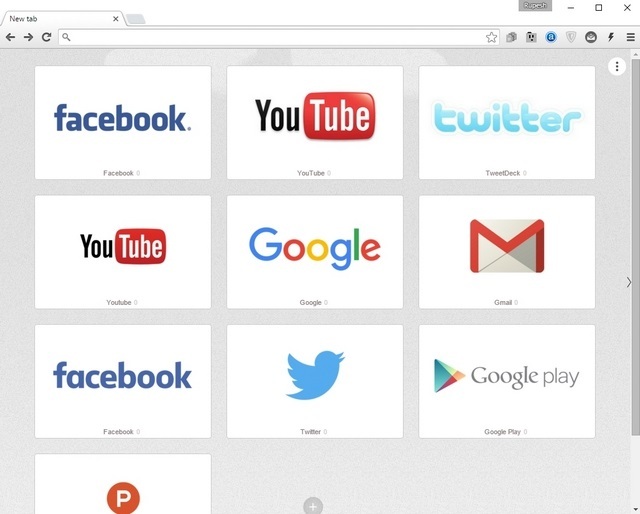 Thankfully, the Chrome web store is full of great extensions that customize the new tab page. Some extensions change it to a more refined look, while some add functionality and some totally revamp the page. 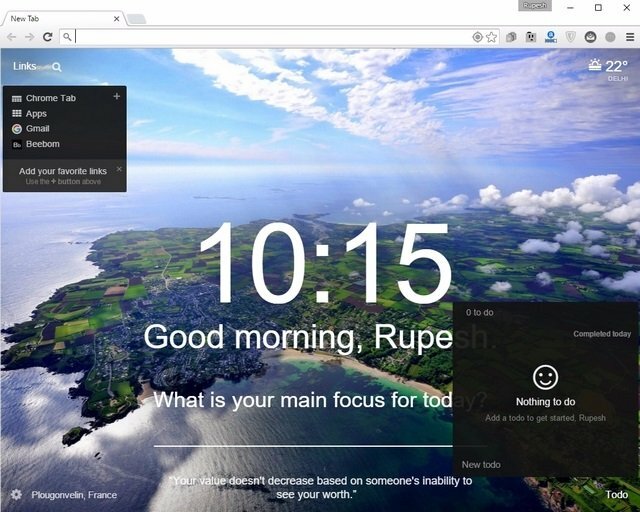 Whatever you are looking for in the new tab page in Google Chrome, these extensions have got you covered. 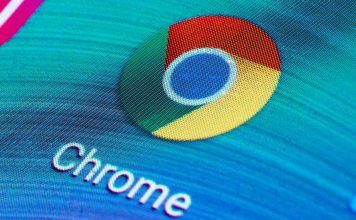 So, without wasting any more time, here’s our collection of the best Chrome extensions that revamp the New Tab page. The very popular Momentum extension makes sure that your new tab looks pleasing to the eye whilst making you productive. The extension brings a new soothing wallpaper each day along with a beautiful quote to keep you motivated. Momentum also includes a clock along with weather information and shortcuts for apps, custom links & search. The new tab extension also lists all your to-dos in a non-intrusive manner and you can also set a daily goal for yourself. 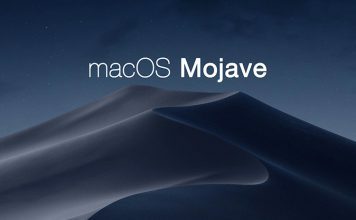 While Momentum might not bring tons of features, its minimalistic look with the few yet important features works as a whole. If you have some issues with Momentum, you can also check out Leoh, which is pretty similar and almost equally good. 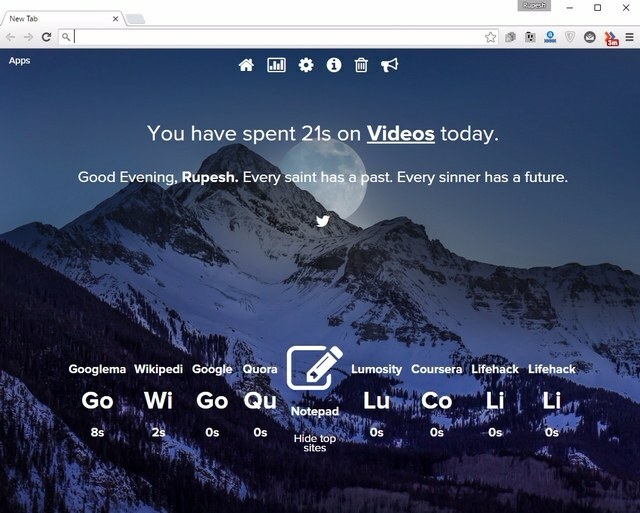 Home is a very detailed new tab page extension that totally revamps the page. The extension looks more like an Android launcher interface rather than a new tab page. It brings shortcuts to various web apps, date & time, calendar, recently closed tabs, search along with notifications and badges for Gmail, Outlook, Yahoo Mail, Google Calendar & Facebook Messenger. There’s also a cool notes widget, ability to add custom widgets and customization through various beautiful backgrounds. Home looks great and works well due to the fact that it totally re-defines your new tab experience with notifications, apps and more. 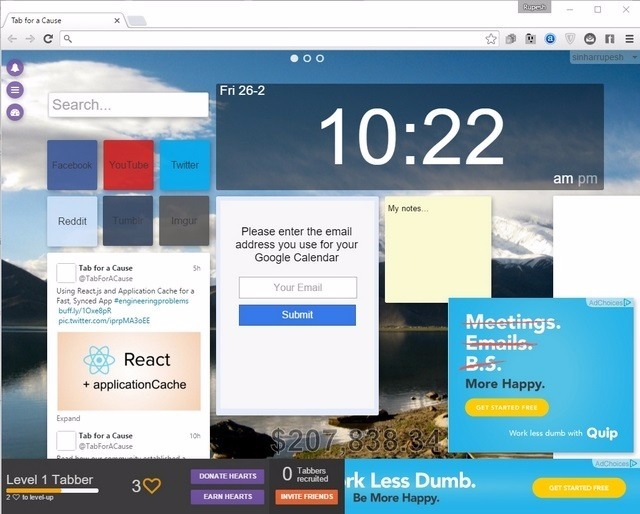 Speed Dial 2 is another very popular extension that replaces the new tab on Chrome. It brings cool looking visual bookmarks and you can sort your favourites in groups for quick access. Speed dial also includes a side bar, that can be accessed on the right edge and it brings your recently closed tabs along with Chrome apps that you have installed. The extension is also no slouch when it comes to looks, as there are beautiful customizable themes to choose from. Last but not the least, we love the fact that it brings insights like the websites you spend your most time on throughout various parts of the day along with the fact that it syncs your settings across devices. Speed Dial 2 is sorely focused on letting you open your favourite websites quickly and on that front, it performs amazingly well. Tabbie is a fairly new extension that replaces the new tab page with content from your favourite sites. The extension lets you add widgets or blocks that show you content from different sources. You can choose from built-in sources like Reddit, Behance, Github or add your own custom URL. 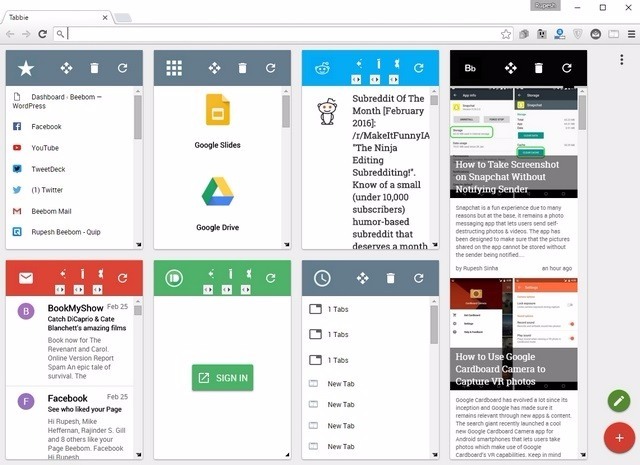 It also supports widgets for Gmail, Pushbullet, so that you can manage all of them from your new tab itself. The customization options include ability to edit a block, resize it, rename it and more. If you want to have a cool overview of the websites that matter to you, Tabbie should work just fine. Start.me is an extensive new tab replacement extension, which aims to make things more productive for you. The extension includes various blocks or widgets and there are thousands of widgets like calendar, bookmarks, email, webpage embed, Google tasks, news, etc. to choose from. Plus, all the widgets can be customized with ease and that’s not all on the customization front, as you can personalize the whole Start.me page with different backgrounds, options like number of layouts, transparency and more. Moreover, you can add different pages for your personal needs, work etc. 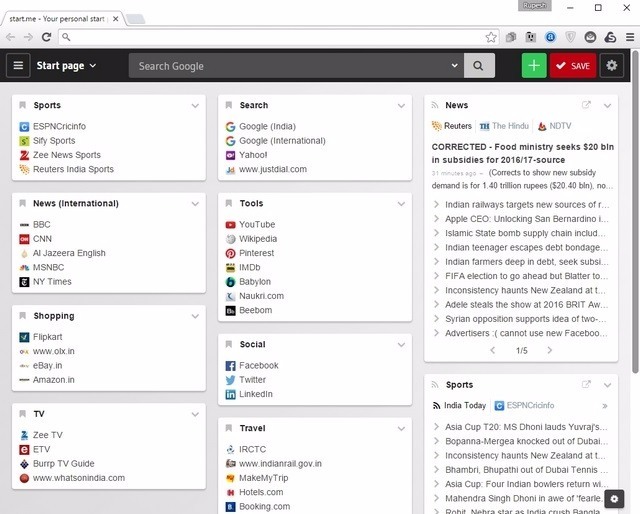 To sum things up, Start.me makes sure that your new tab page brings you all the information you need. Having said that, the extension can be overwhelming at times, especially when you make changes to everything. Also, the Start.me pages take some time to load if your internet connection is spotty. Be Limitless is aimed at users looking to know about how they spend their time online and how they can make themselves productive on this front. 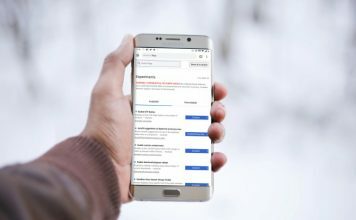 It brings a simple looking new tab, which shows you your goals, reminders, countdowns, to-dos, weather info along with the stats related to your browsing habits. All of that with gorgeous photographs in the background to make it soothing to the eye and quotes to keep you motivated. The focus here is of course on the detailed stats of the time you have spend on certain websites. You can even go ahead and combine similar websites to a single category and the extension will bring you stats based on that. For instance, you can combine various social networks into a category dubbed “Social” and the extension will bring you the time you have spend on these sites. There’s also a pause button, if you don’t want Limitless to track your activity. Did you ever think that opening a new tab could help somebody? Well, that’s what Tab for a Cause does. The extension replaces your new tab, so that you view sponsored content along with ads every time you open a new tab and whatever the ad revenue is made by the company goes for charity. That’s not all though, as it also adds functionality like widgets for your favourite websites, bookmarks, calendar, notes etc. There’s also the cool “Tabber stats”, which lets you know the number of times you have opened a new tab along with the impact the app is making on the world. 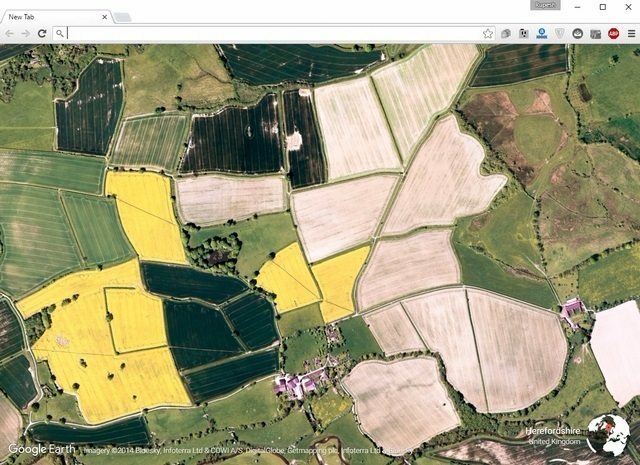 Earth View, as you might have guessed, replaces your new tab with a beautiful satellite image from Google Earth. The images change every time you open a new tab, which makes the experience even better. You can view the location of the image shown in Google Maps, download the image or visit the web gallery, which features tons of such breathtaking images. Keep in mind though that you will need a decent internet connection for the extension to show you a new image everytime. You can also try Dream Afar, which brings you beautiful new images on your new tab every other day. 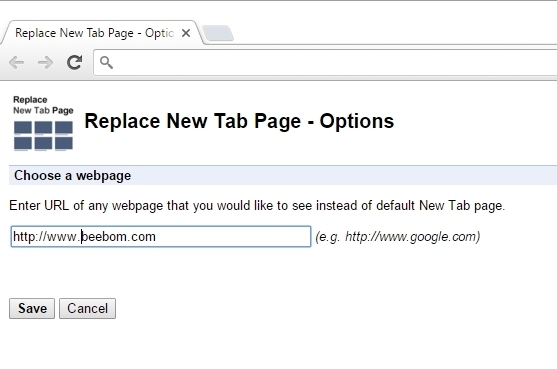 Replace new tab page extension lets you replace the normal new tab page with a website you want. For instance, we added Beebom as the new tab page through the extension and every time we opened a new tab, Beebom would open up. A cool way to visit your favourite website, right? 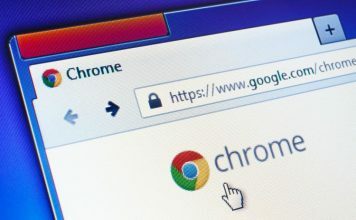 Unlike other browsers, you cannot set Chrome to show a blank screen when a new tab is opened and that’s what the Blank New Tab extension is here for. After you install the extension, you will see a new tab with a white screen. Ready to spice up your New Tab page on Chrome? The new tab page is something we visit innumerable times daily, so why not make it more fun or functional or productive. Well, this is what these extensions do. Install these Chrome extensions and spice up your Chrome new tab and do let us know your favorite extension.